We proudly use Easihair Pro (EHP) for our tape extensions. EHP extensions are uniquely designed to lay completely seamless and undetectable in the hair. EHP extensions offers unique hair extensions that are designed to lay seamlessly and undetectable in the hair. These extensions are made with cuticle intact, 100% real human Remy hair. This system is easy to use, maintain and allows you to reuse the extensions for months with proper care and maintenance. Made with 100% Remy human hair with the cuticle intact. Having the cuticle intact means the hair remains tangle-free, shiny and manageable. We offer 30 neutral, dual and try-blends as well as 9 fun colors. Add length, volume and chemical-free color in 60 minutes or less! They are committed to not only selling their customers high-quality hair extensions, but “Creating Successful Salon Professionals” through their exceptional education courses. Our tape in hair extensions are natural and comfortable. Our panels lay flat on the head, which means they are virtually undetectable. These tape extensions are reusable and be reapplied every 5-8 weeks, with proper care and maintenance. EHP extensions has provided our salon with very high quality education. This sets us apart not only from other salons, but from other hair companies as well. This hair quality is better than any I have ever seen before. Because of this, we guarantee our work and extension quality. We have been trained to perfectly color match your new extensions as well as how to perfectly blend the extensions with your natural hair without having to cut your own hair. This extension is perfect for a wide range of individuals who are growing out their hair and need a little help getting through the sometimes difficult stages of growing ones hair out. 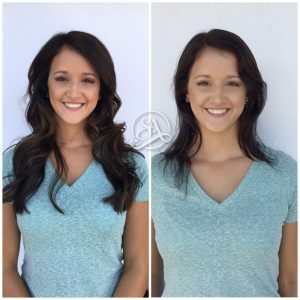 As with all extensions, there is maintenance involved with this type of extension, but getting through those awkward stages of growth makes it completely worth it! During our perfect consultation, We will determine the best extension application for your hair during your consultation.